To all you woodchuck-chuckers out there, I know I may be a little early with my Groundhog Day celebration, but I’m so excited I just couldn’t wait!! Sunday marks one of my favorite holidays of the year, the day we look to a large squirrel predicting the weather. But Groundhog Day has become so much more, thanks in large part to the 1993 dark comedy classic starring Bill Murray. Full disclaimer, I happen to have grown up very close to Punxsutawney, PA, so that could be a reason this movie has endeared itself to me so strongly over the years. The polka music, the puddles of frigid murky water on street corners, the blizzards that move off to the east and hit Altoona- ah, childhood. In Groundhog Day (DVD/Download), Bill Murray plays a weatherman Phil Conners who is sent to tiny little Punxsutawney with his producer and cameraman (played by Andie MacDowell and Chris Elliott, respectively) to cover Groundhog Day. He’s the cynical prima donna who rails against small-town life and finds annoyance in the quaintest of celebrations. While there, a strange phenomenon overtakes Phil, and he begins waking up every day in the same bed in Punxsutawney, on Groundhog Day. No matter what he does, he finds that his actions have no consequences, and the reset button keeps getting pushed on his life. In order to move on, he has to become a better man. What this has to do with the annual Groundhog prediction I’m not totally sure, but it does provide a fantastic backdrop. Of course, the comedy turns pretty dark as he begins to cycle through various ways to kill himself rather than endure one more day in Punxsutawney (understandably so), but there are also rare gems of comedic brilliance as he goes on a wild drunken bender through town, eats an entire restaurant menu while smoking a cigarette because there are no health consequences anymore, and executes a flawless bank heist. Murray is absolutely perfect as he transitions from cynical to desperate to charming, and even Andie MacDowell manages to turn in a performance that isn’t terrible. 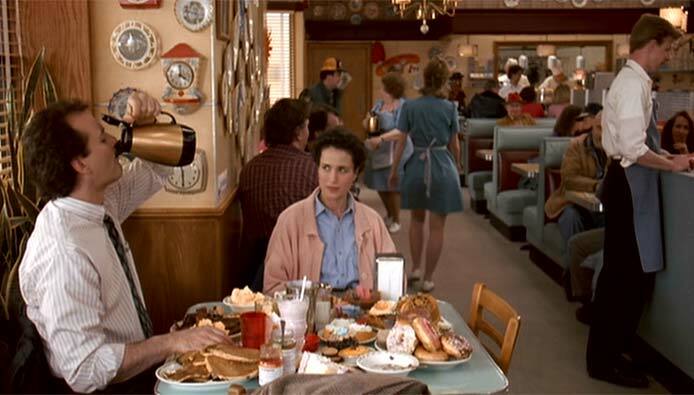 Every year on Groundhog Day, my husband and I have started a tradition where we eat and drink like there’s no tomorrow, and live that day like we wish we could live every day for the rest of the year. The point being, if we were to suddenly wake up on February 3rd and it was still February 2nd, we’d like to plan a day that we could enjoy over and over again. With that idea of no consequences and no tomorrow in mind, my cocktail is a doozy this week. No, it’s not Sweet Vermouth on the rocks with a twist (I have one thing to say about that- Bleh). Instead, I’m serving up something a little more wild- a Don’t Forget Your Booties Shake. BING! Combine all ingredients in a blender with ice. Blend until liquefied, and then pour into a glass. Top with a dollop of whipped cream. This really is the most calorically stupid mixed drink I could think of. Also, watch out for that first sip- it’s a doozy. Enjoy it today, because I like to think that on Groundhog Day, the possibility of no tomorrow and therefore no hangovers is exponentially higher. I know the original point of this holiday was for the groundhog to predict an early spring or six more weeks of winter, but as any Western Pennsylvanian can tell you, that whole thing is a joke. There are ALWAYS six more weeks of winter, even if Punxsutawney Phil doesn’t see his shadow. As Phil the weatherman says, “it’s gonna be cold, it’s gonna be grey, and it’s gonna last you for the rest of your life.” So drink up, laugh at Needlenose Ned the Head, shove an entire piece of angel food cake in your mouth, and make February 2nd the best day of your life (because you may see it again tomorrow). Cheers! Posted in Comedies and tagged Andie MacDowell, Bill Murray, Chris Elliott, Don't Forget Your Booties, Groundhog Day, Needlenose Ned, Punxsutawney, Punxsutawney Phil. Bookmark the permalink. This week’s selection was a bit of a challenge. In my opinion, a blog on cocktail and movie pairings wouldn’t be complete without Sofia Coppola’s 2003 masterpiece Lost in Translation. Set in Tokyo, this unexpected love story features Bill Murray in one of his finest roles, playing an American movie star sent to Japan to endorse a whiskey. While there, he meets Scarlett Johansson’s character Charlotte, a fellow American and malcontent. They share a drink at a swanky hotel bar, and spend the rest of the movie exploring Tokyo and maybe possibly falling in love. The reason I say that this selection was challenging is because I personally am not a frequent whiskey drinker. I skew more toward gin and vodka concoctions, which for this movie seems all wrong. Bill Murray does a fantastic job of selling us on Suntory whiskey, and by the end of the film I want to drink a glass on the rocks and do goofy impersonations of the Rat Pack, just like him. So here’s what I suggest. If you like whiskey, buy this movie and a bottle of Suntory’s Hibiki blended single-malt, drink a glass or two and imagine you’re as cool as Bill Murray. However, for the non-whiskey drinkers of the world, I’ve come up with a cocktail that I personally enjoy and that also stays true to the spirit of the film- The Whiskey Amour. Combine all the liquid ingredients into a cocktail shaker filled with ice. Shake and strain into glass, garnish with grapefruit twist. This drink is basically a Brown Derby, but I like to sweeten it a bit by adding more honey syrup than is typically called for. In relation to the film, it works on several levels. I’m using an American whiskey as a nod to the two American protagonists. The pink hue of the grapefruit juice references the opening scene of the film, and the honey references the music over the final scene of the film. This cocktail is to be enjoyed while you’re marveling at the amazing shots of Tokyo, and yearning for Charlotte to leave her hipster husband and run into Mr. Bob Harris’ arms. Drink enough and you may be tempted to sing along during the karaoke scene. Drink too much and you’ll be singing along with Sausalito. What this week has taught me is that sometimes life surprises you. Whether it’s a May-December romance in Tokyo or a bourbon cocktail in your living room, the best experiences are often the ones you never saw coming. Cheers! 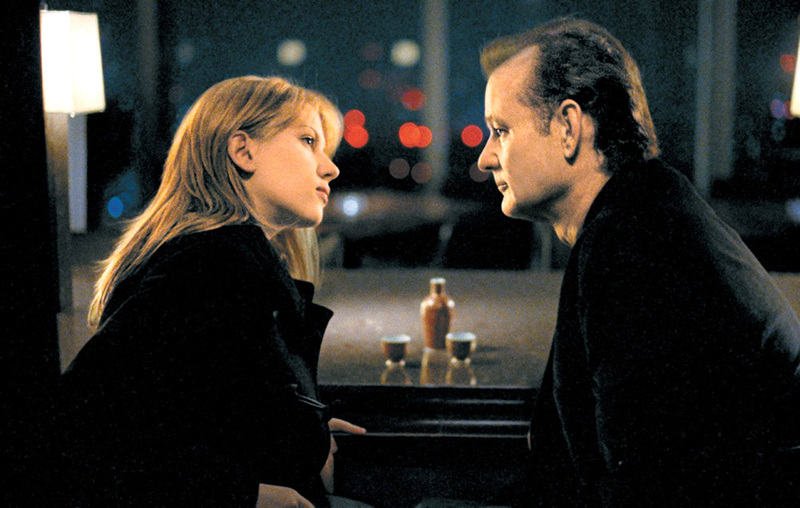 Posted in Dramas and tagged Bill Murray, Bourbon, Lost in Translation, Scarlett Johansson, Sofia Coppola, Suntory, Tokyo. Bookmark the permalink.